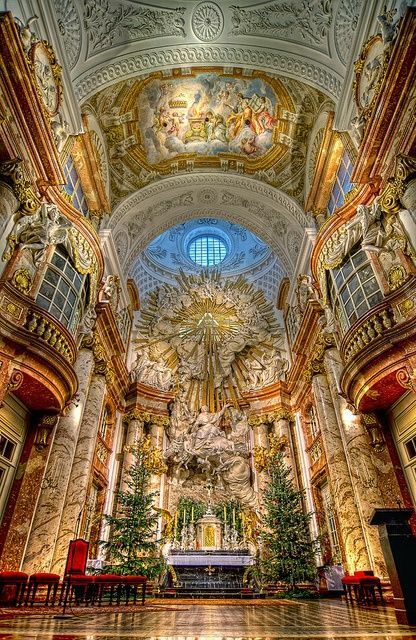 St. Charles's Church is a baroque church located on the south side of Karlsplatz in Vienna, Austria. Widely considered the most outstanding baroque church in Vienna, as well as one of the city's greatest buildings, St. Charles's Church is dedicated to Saint Charles Borromeo, one of the great reformers of the sixteenth century. Located on the edge of the Innere Stadt, approximately 200 meters outside the Ringstraße, St. Charles's Church contains a dome in the form of an elongated ellipsoid. Since Karlsplatz was restored as an ensemble in the late 1980s, St. Charles's Church has garnered fame due to its dome and its two flanking columns of bas-reliefs, as well as its role as an architectural counterweight to the buildings of the Musikverein and of the Vienna University of Technology. The church is cared for by a religious order and has long been the parish church as well as the seat of the Catholic student ministry of the Vienna University of Technology.